Man, since origins, has always been struck and fascinated by the vastness of the heaven and its secrets. It was his thirst for knowledge that pushed him to challenge gravity, the critical points in order to explore new space horizons more closely. 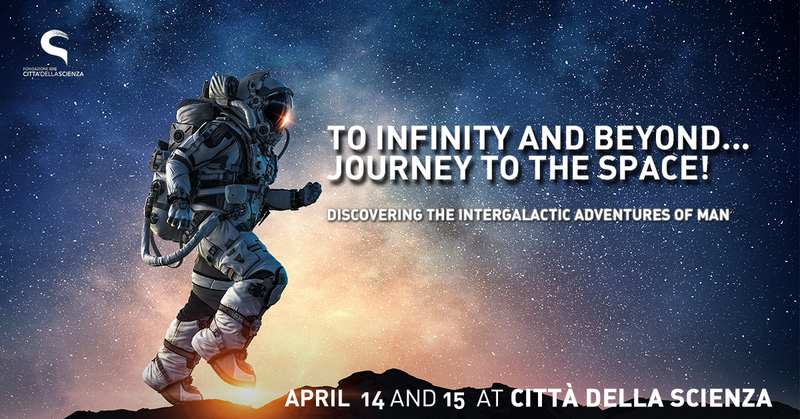 On the occasion of the world day of human travel in space, which falls on April 12th, Città della Scienza, with the most beautiful 3D planetarium in Italy, organizes a weekend on the theme of space and space explorations. Many activities and scientific laboratories in the program will fascinate a wide public, because, after all, we are all made of “star dust”! Special guest on Sunday April 15 will be Team Space4Life , a team of three young Neapolitan science students who will illustrate the concept of the Radio – Shield experiment, winner of the Lab2Moon world competition, a competition born to create an experiment to be sent to the moon. Only Sunday, April 15, at 11 and 11.45 am, a new fantastic activity awaits you at the Planetarium “Walking through the constellations“: a live show conducted by the U.A.N. (Unione Astrofili Napoletani) that will accompany us to discover the wonderful world of the constellations. The stars have always been the reference point for those who must orient themselves. Today, thanks to the most modern GPS technologies made available by the network, we know our position at any time and how to reach any place on planet Earth. But, once, without these technologies, how was one oriented? Thanks to the stars obviously! Today we will discover how we orient ourselves thanks to the stars and we will launch in the individuation of the Polar star and the other useful ones for “never lose the route”. And again, protagonists of this sensational show the most beloved spring constellations, in a journey through myths, curiosities, legends and scientific data. A walk through the stars, not to be missed. Did you know that 100 years after the First Step of Man out of the Earth, there is a high possibility to have a real Cislunar city composed of 10-12 sites (“neighborhoods”) located between the Earth’s orbit and the moon, with about 1000 inhabitants? At Città della Scienza the Center of Near Space awaits you with – Expansion of Humanity in Space: the CNS presents “OrbiTecture” and “Hyplane”. And returning to the theme of the constellations, who has not enjoyed, at least once in their life, to try to recognize the constellations in the sky? And to unite the various stars, like dots on puzzle games, to try to bring out recognizable and familiar shapes? The constellations are much more than a set of stars: they are legends, myths and curiosities, able to enchant and fascinate young and old. Discover them in a fun laboratory and play your favorite constellation using recycled materials. Participate in “Constellations of galaxies of energy“. Microgravity is a particular condition that occurs on board space platforms in orbit around the earth. The microgravitational environment offers various opportunities for scientific investigation in many fields, including fluid physics, combustion, biology, life and materials sciences. With “Space Laboratories and Microgravity” discover what are the experiences in microgravity in different disciplines and on different platforms currently used for scientific research in microgravity. And again, the appointment with “The missile launcher“: did you know that in a paper airplane there is a lot more science than you imagine? Challenge your friends, building the airplane of the form you prefer and trying to launch it as far as possible! You will make it? Space, astronomy have always been fields dominated by men, yet there are few astronauts women who have traveled in space and made their skills available! The most famous is Samantha Cristoforetti, the only Italian woman to have spent the longest stay in orbit in a single mission. In her honor, celebrating women in space, do not miss the workshop of building a “supergalactic rocket” in “AstroSamantha Cristoforetti: towards infinity and beyond …“. Are you a big fan of astronomy but unfortunately live in the city, where watching the sky is practically impossible, due to smog, light pollution or simply too many days of bad weather? No fear! Participating in the laboratory “Sky on the roof” you will have the opportunity to build a small “projector of constellations” and transform your room roof into a beautiful starry sky! The starry sky has always represented for Man, since origins, a fascinating spectacle. Did you know that the stars are not randomly scattered in the Universe but grouped in colossal sets, clusters, or families called galaxies? With “Stardust” discover how many and which are the different types of galaxies, recognize the shapes and complete your spatial Lapbook! The exhibition dedicated to the sea can be visited again! Discover which new fish, molluscs and crustaceans live in our tanks following the guided tour “Marine Ecosystems“. During the visit, you will have the opportunity to caress some live marine organisms in our Touch pool. What an emotion! For the little ones, “Create marine animals“, a laboratory where you can color fish shapes, inventing new species, and then, as for “magic”, make them appear and swim in a large virtual aquarium. “Insetti & CO”, the new exhibition space dedicated to the spectacular world of insects and much more. For every man on Earth there are over 150 million insects. “The six-legged giants” have conquered almost all the habitats of our planet … it’s time to start getting to know them better. Discover all the secrets that have made them so successful in a route divided into six thematic islands, one more engaging than the other! In addition to guided tours to Corporea, the first interactive human body museum in Italy, just for this weekend, the 3D “Robot Explorers” returns to great demand to travel together with probes, landers and orbiters within our solar system.